Well, after snowing earlier last week, I'm happy to say that this weekend has been really nice for fall! Sunny and almost 60 degrees. Very nice compared to the freezing temps and snow (yuck!) we got last week. 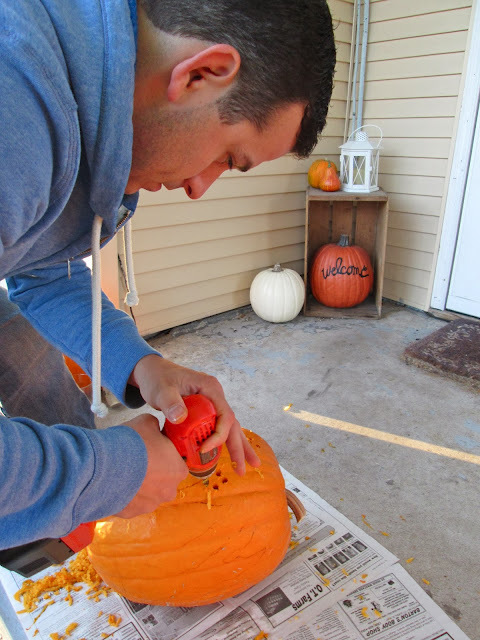 With the nice weather, Trent and I decided to carve drill pumpkins outside on the porch yesterday. They turned out pretty awesome, I'd say! I started with my pumpkin - we got all of our pumpkins from Grandma and Grandpa's pumpkin patch this year. 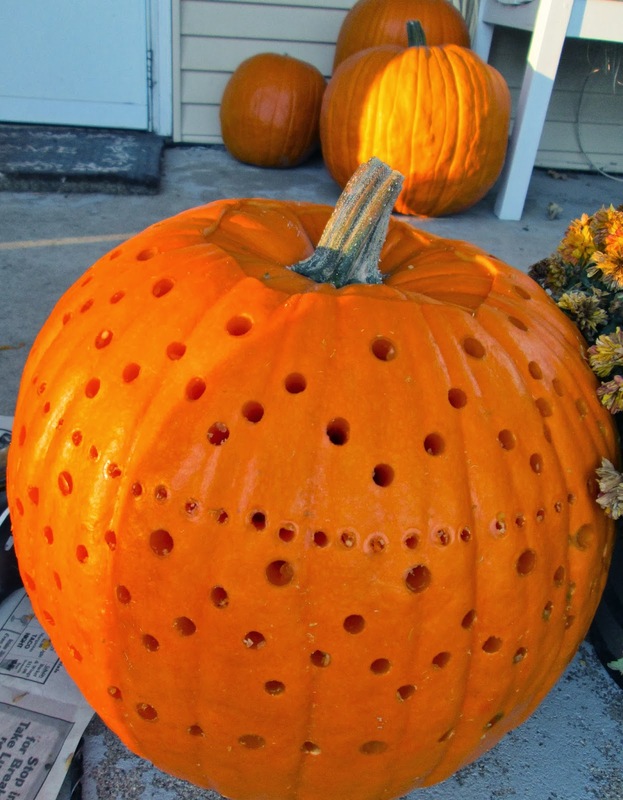 Then I used Trent's drill bit set, which had a scale like this, to mark where I wanted all of the holes to be. I just used the scale as kind of a "stencil" to draw on all the holes with a black washable marker. The sizes of drill bits I used to make my design, from smallest to largest, were: 3/16, 19/64, and 3/8. I went in kind of a zig-zag pattern, alternating between large and small...after I started drilling I added 1 more row of really small holes that I just freehanded for an extra "pop." 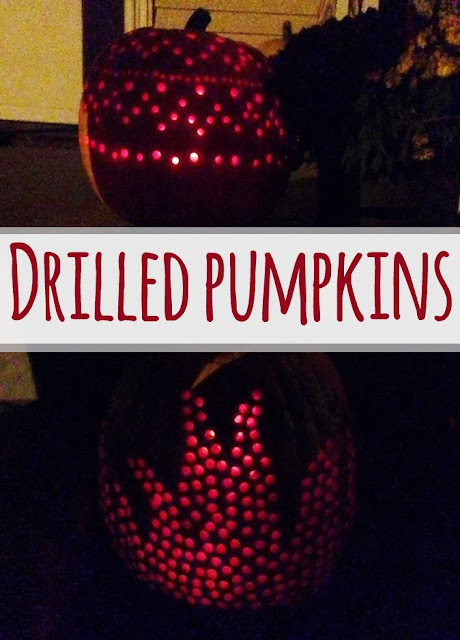 Trent showed me how to use the drill (I've never really used one before). At first it was weird but I got used to it quickly. I'm sure it's much easier to drill through a pumpkin then a wall or a board or something! 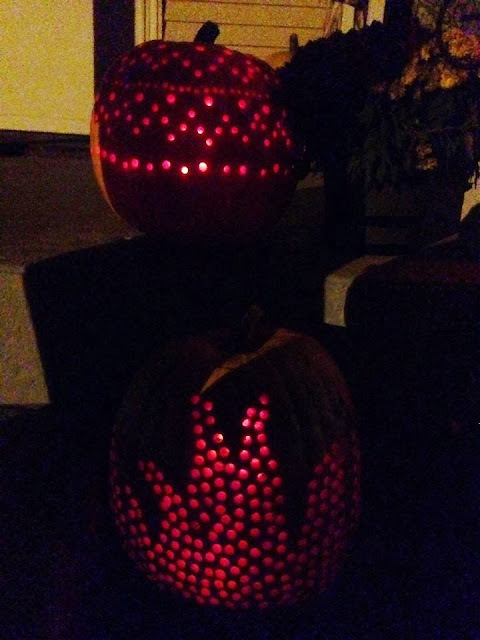 I did the biggest holes first, then went to the smaller ones. It is pretty messy, so I recommend doing this outside on newspapers! 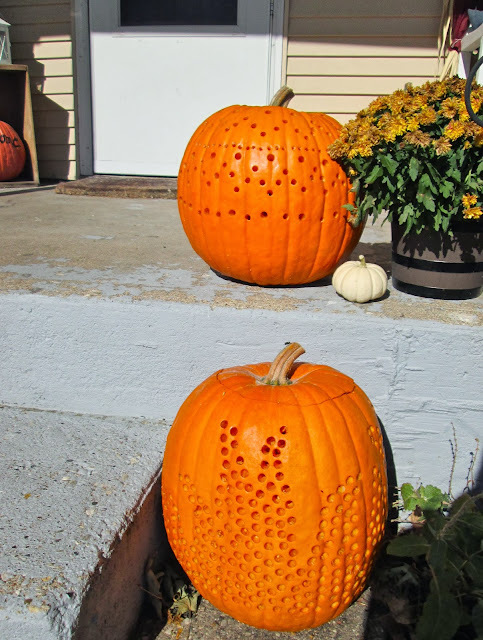 The pumpkin guts kind of splash out a little with each hole. I didn't wipe them off until the end, though, because the wetness will wash the marker off. 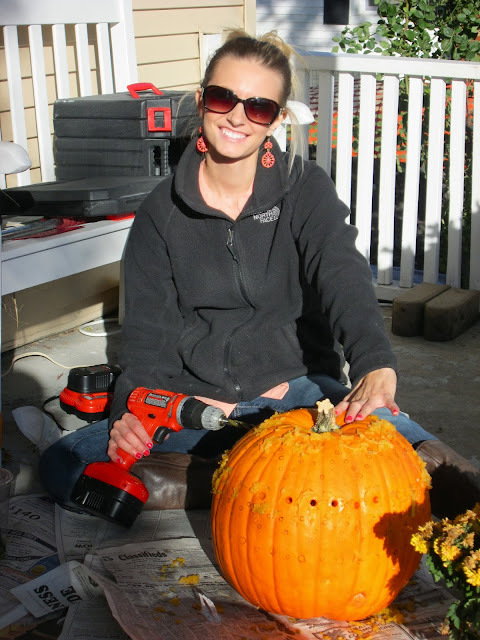 I was pretty proud of myself for using the drill all by myself! Now to Trent's pumpkin. Here he is with his pumpkin before he drilled - you can kind of see the outline he drew on with a marker. 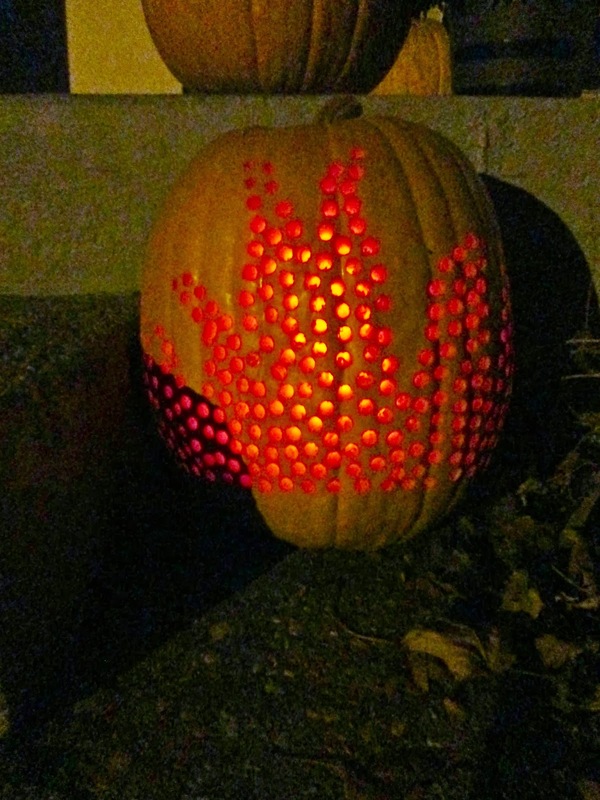 He drew an outline of flames, then filled in the flame with drilled holes. 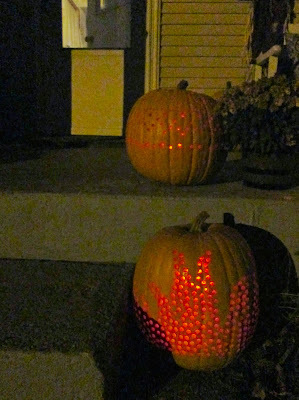 They look pretty cool at night on our porch, too! 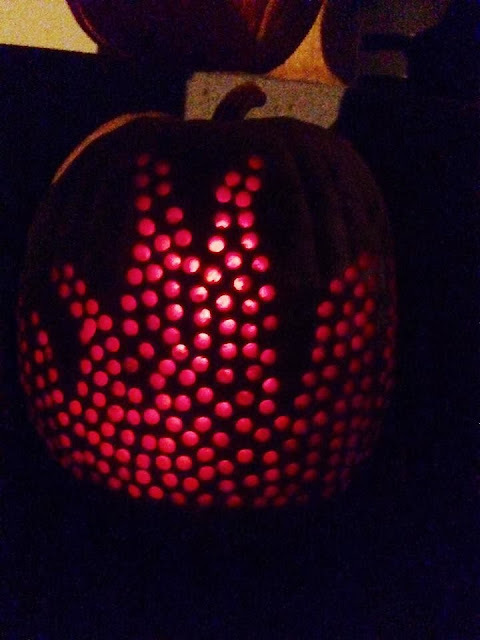 Has anyone else carved pumpkins with a drill? 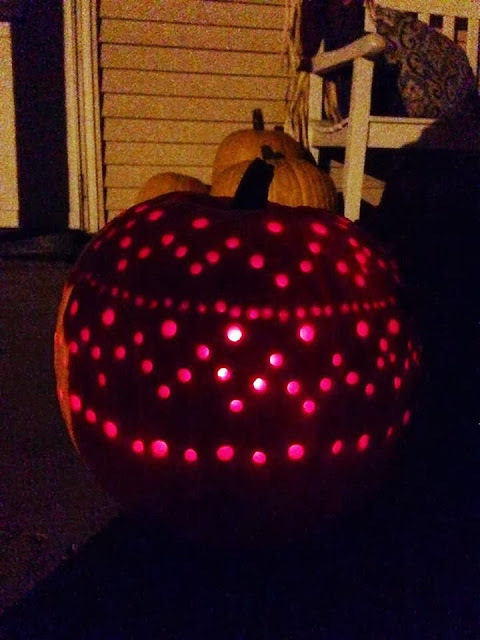 I would love to see how yours turned out! 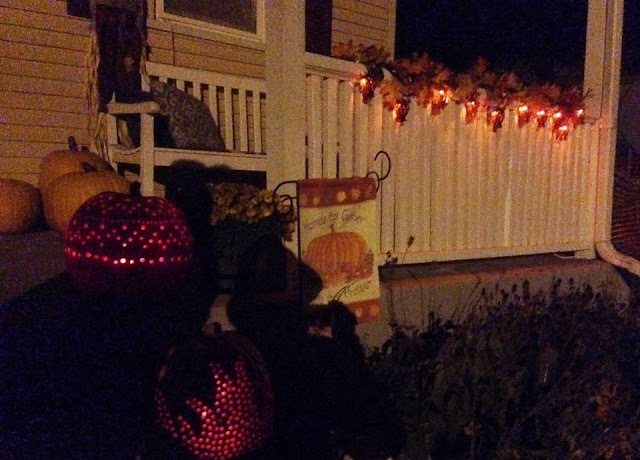 Linked to: Suburbs Mama, Tatertots and Jello, The Pin Junkie, Domestic Superhero, Liz Marie Blog, Twelve O Eight.